Billed as the world’s biggest coffee roaster competition, the Golden Bean 2016 was held last month in Port Macquarie. Amongst the hundreds of entries we were delighted that Brad’s roasting skills were awarded in two categories – Pour Over Filter and Decaf. Brad refuses to roast specially for competitions but for the first time agreed to enter three of his production roasts in the competition. 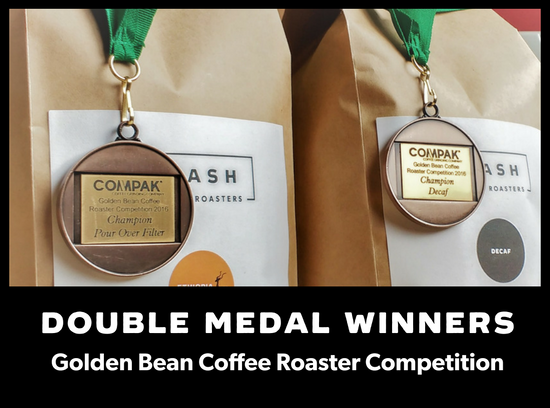 Receiving the two awards therefore is validation of his unwavering committment to make every batch of coffee roasted by Stash meet his high standards.